This spring we had the WORST mosquito problem. It was so bad that our municipality adopted a garlic spray plan to reduce them. We decided to take it a step further by installing our own backyard pond. Mosquitos lay their eggs in water; fish eat them. 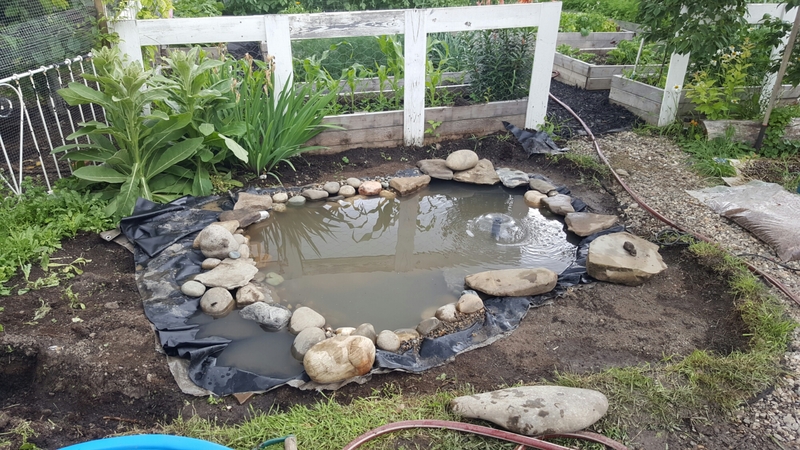 We thought a pond would be a clever way to attract and eliminate the mosquitos. First thing I did was find a liner at my local garden supply store. 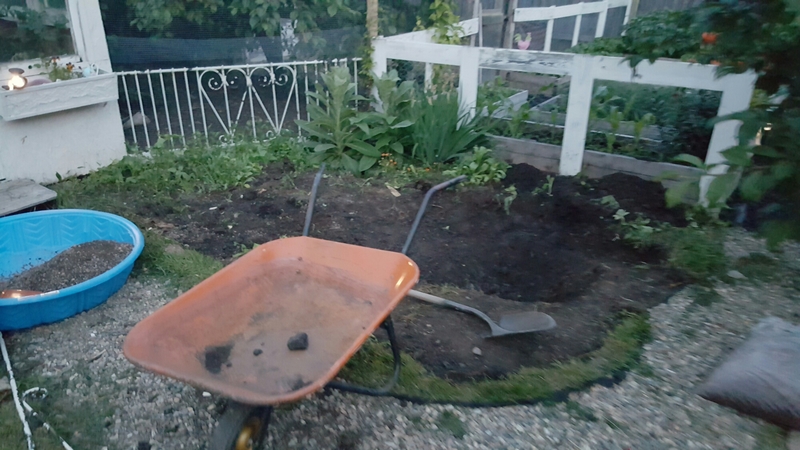 Then I began to dig a shallow hole roughly the size I wanted the pond to be. The whole thing was willy-nilly. I had plants growing in the area that I should have transplanted prior to starting the project, but I’m not so much a planner as I am a do-er. After I dug out the basic shape, I dug a smaller, deeper hole within the bigger hole. This is somewhat critical to good pond design because you’ll never be able to stack rocks perfectly vertical along the pond walls. 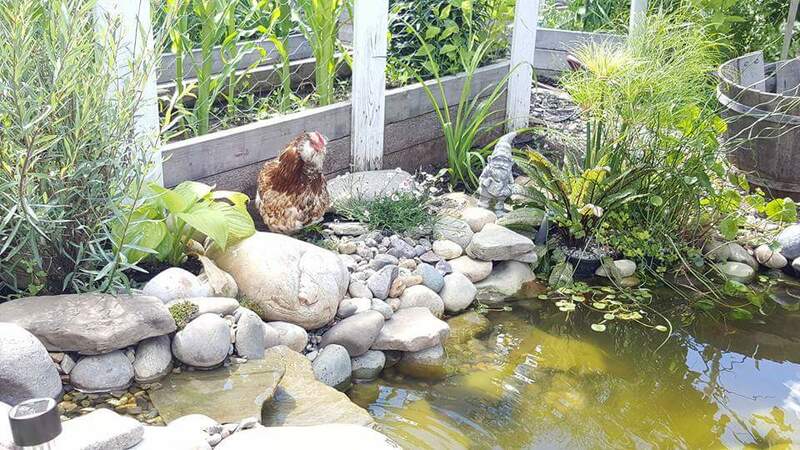 Giving a bit of an angle to the walls allows the rocks to rest along the pond floor and up the edges without risking them falling into the pond bottom. Once the hole is all dug out, you want to lay down a tarp or old rug as a sort-of ‘buffer’ from any sharp stones to prevent puncturing the liner. 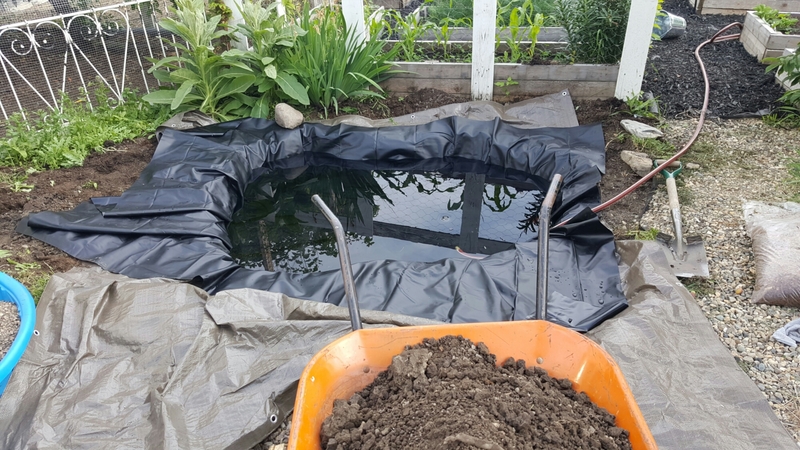 And THEN place the liner and begin filling the pond. Some people will say to add the rocks first and then the water. I did it the other way around. This made the pond water very dirty. 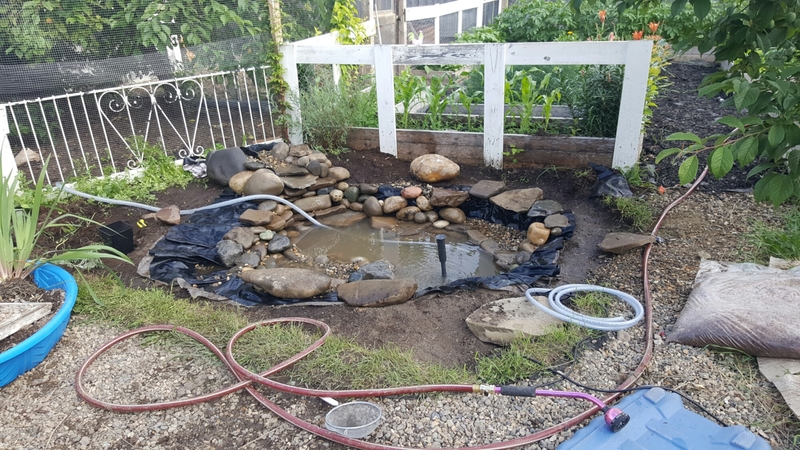 So I ran the pump with the output draining into the garden while the garden hose kept the pond full with a continuous flow of fresh water until the pond became somewhat clear. In the photo above, you can see to the far left that theres a very shallow area of the pond. I did this so that I could plant a water-tolerant creeping-jenny that would help to ‘drink up’ the excess nitrogen created by the fish in the pond. I also built up a stone waterfall area. I created a staircase out of flat stones. On top of the ‘steps’, I placed a scrap piece of liner. I tucked stones on either side of the path for the water to follow. 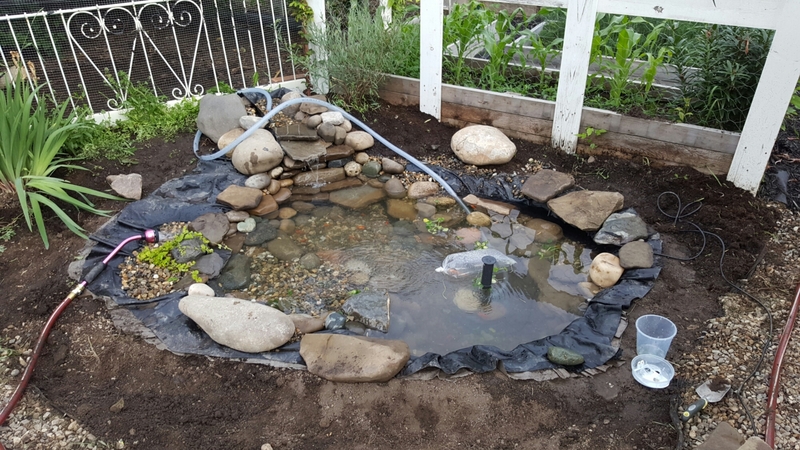 Then on top of the liner I placed flat stones for the water to run over and hid the edges with more stones to make it look natural. 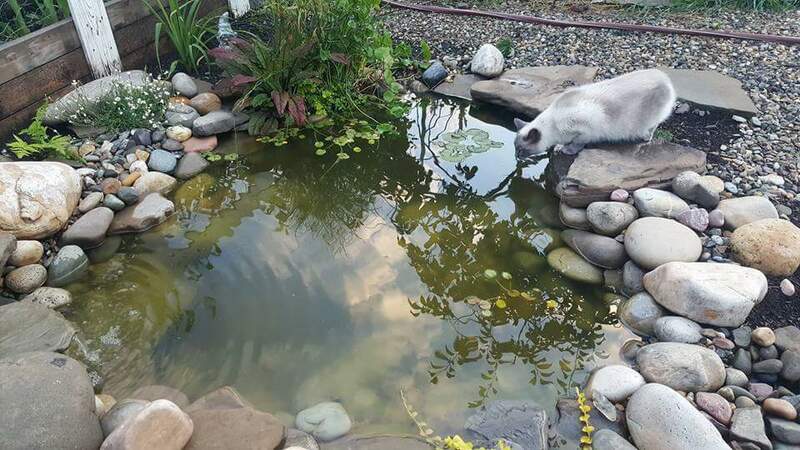 I used a sealant designed for ponds to fill in spaces and gaps between the stones so that instead of flowing beneath the flatrock, the water would be forced to casacde over the top. I wish I’d have taken photos of the whole waterfall process but alas, I forgot; luckily everything I did is available as tutorials around the internet. I started adding plants around the edge of the pond. My dearest husbeast brought home a cool ‘basket’ of water plants that just so happened to fit perfectly on one of the shelves I had made on the ponds’edge that you can see on the right of the photo below. The creeping-jenny on the left. Some hostas and creeping thyme. After the cleanup and addition of goldfish I went to the garden store to find ‘beneficial’ bacteria to add to the pond because I had read that balancing the pond helps to reduce maintenence needs. I also picked up some straw bales wrapped in netting. When straw decomposes, it creates hydrogen peroxide which is a natural algae suppressor that is safe to use around fish and plants. I hid it inside the waterfall so that the running water would deliver a constant supply of peroxide to the pond as the straw decomposed. 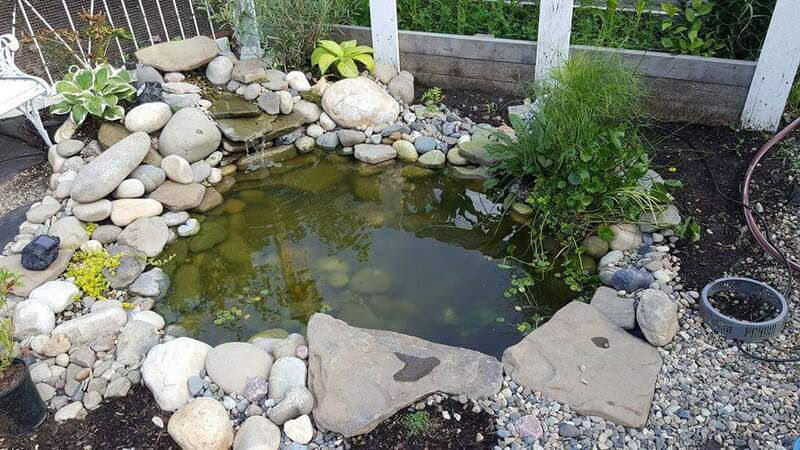 At first I thought my pond was a total failure because it quickly became tremendously murky and all of the submerged rocks developed a thick green layer of algae. Do not panic! Apparently all ponds have a ‘first bloom’ where algae quickly dominates the new pond and then subsides. My pond was crystal clear after the first month or so. 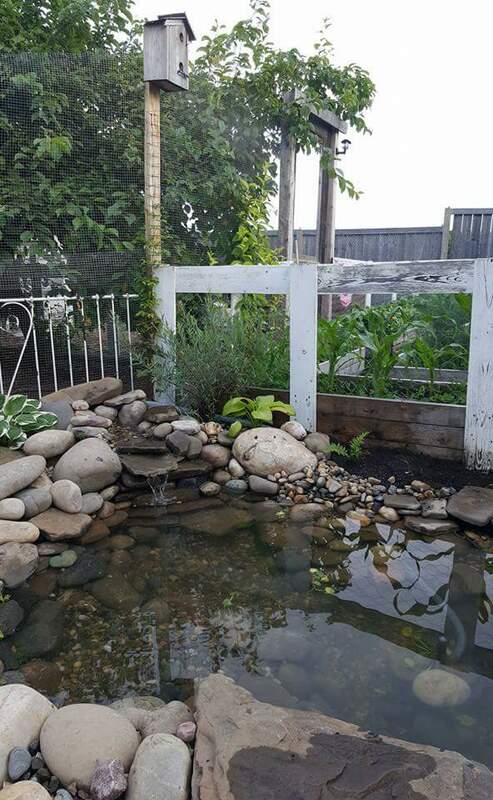 The pond project was a total success! The mosquito problem is hugely reduced and since installing the pond we enjoy a greater variety of birds and butterfly visitors in the garden than ever before. Looks great! I tried doing something like this at our old house, and it failed miserably (mostly because the kids kept playing with the stones)!